Within the remote sub region of Karamoja in northeast Uganda, livestock diseases are an ongoing problem. 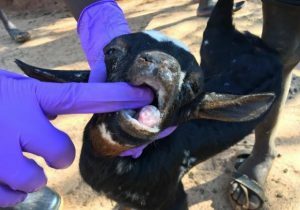 Further, limited knowledge about the occurrence and spread of diseases such as Peste des Petits Ruminants (PPR) or goat plague is problematic, as the disease can be fatal. Because the region provides livestock nationwide, its disease control problems may affect the entire country. With the right tools and training, local animal healthcare providers are now quickly recognizing and responding to PPR outbreaks, preventing disease spread. Under the umbrella of the global PPR eradication effort led by the World Organization for Animal Health and the United Nations Food and Agriculture Organization, the PPR Vaccine Associate Award, as part of the Feed the Future Innovation Lab for Livestock Systems, applies lessons learned from past successful livestock disease eradication efforts to pilot an eradication strategy. It relies on epidemiologically targeted vaccinations, a thermostable vaccine, and business model incentives for local entrepreneurs. Vaccination targeted at hotspots allows for faster, more efficient protection of livestock populations than generalized, mass vaccination. Successful targeting relies on a clear understanding of areas of disease activity and patterns of movement. Yet livestock and disease data in Karamoja are sparse, sometimes outdated, and not easily accessible. PPR is a challenging disease to diagnose and track. Its signs and symptoms overlap with other common diseases of small ruminants, often requiring laboratory testing to confirm. Nevertheless, the disease syndrome is known and can be clearly described by herders who have regularly encountered it in their flock. Participatory methods can be used to link this ground level knowledge of disease into national surveillance networks. To achieve this aim, the project has used several strategies. Established a Standard Operating Procedure for communication between the project and the Ugandan Ministry of Agriculture Animal Industries and Fisheries and available research laboratories. With improved surveillance, three PPR outbreaks were detected and confirmed in April-July 2018. These three outbreaks occurred within the hotspots the project had initially targeted, validating the project’s epidemiological understanding of the disease systems active in Karamoja. District level governmental veterinary services responded to all three, helping to mitigate the effects of the disease on the local populations. PDS trained veterinary officers involved in the outbreak investigation were empowered to provide rapid field tests and clear communication. 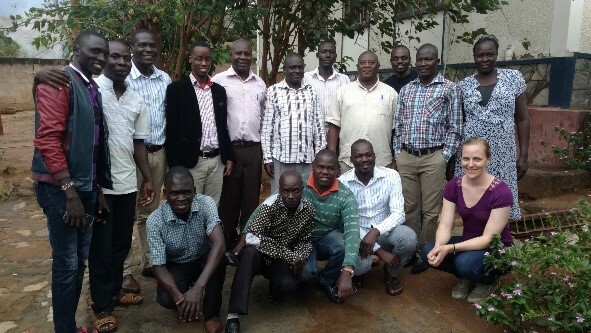 With the increasingly refined epidemiological understanding of PPR in Karamoja and the knowledge and means to investigate suspected outbreaks, the project is now in a good position to pilot its targeted thermostable vaccination against PPR.